A clump of acryllic fibres seen under a microscope at Plymouth University’s Electron Microscopy Centre. New research shows that as many as 700,000 microscopic fibers are released into the environment each time we do the laundry. It’s a problem with no easy solution in sight. For years, scientists and environmentalists have wondered—and worried—if the simple act of washing our clothes might be triggering the release of microscopic plastic particles. A new Plymouth University study, now published in Marine Pollution Bulletin, shows this is very much the case. The new research shows that over 700,000 microscopic fibers are flushed down the washing machine’s drain each time we run a load in a conventional washer. These particles are tiny enough to pass through sewage treatment plants and leech their way into the environment, where they pose a threat to fragile ecosystems. Microplastics are bad news once they enter into the environment. Measuring as small as 0.355 millimeters in size, these tiny bits of plastic cause all sorts of problems for marine organisms. Plastics absorb toxins—like PCBs, pesticides, and motor oil—like a sponge, poisoning the food chain. Easily ingested, they start to build up in an animal’s digestive tract, hindering its ability to absorb energy from foods. Earlier this year, European researchers discovered that young fish get hooked on plastic microbeads (the kind you find in exfoliants), stunting their growth and making them more vulnerable to predators. 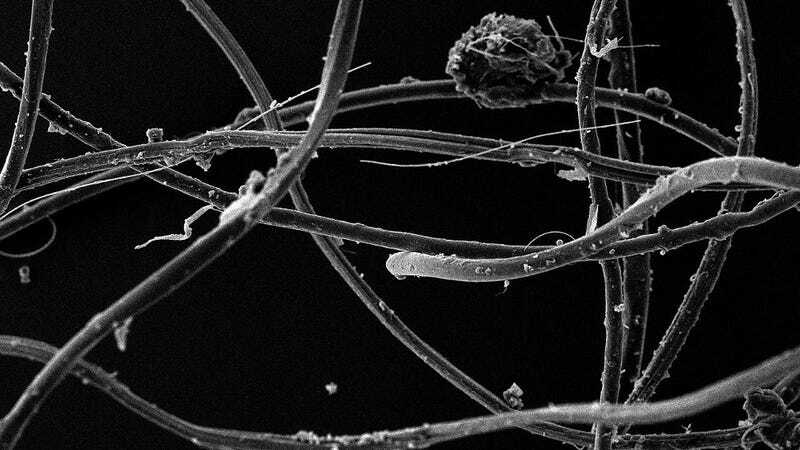 Researchers have suspected that synthetic textiles release microscopic fibers during the wash, but no definitive proof has existed. To see if this is in fact the case, PhD student Imogen Napper, with the help of Plymouth University professor Richard Thompson, looked at the mass, quantity, and size of fibers that leech into the wastewater after synthetic fabrics are washed at standard temperatures. For the study, the researchers washed various fabrics at 86 and 104 degrees Fahrenheit (30 and 40 degrees Celsius) using various combinations of detergent and fabric softeners. The researchers sent the different batches of wastewater to the lab for analysis where a scanning electron microscope was used to determine the size, mass, and quantity of the plastic particles. The researchers found that washing 13 pounds (6 kg) of polyester-cotton blend fabrics released (on average) nearly 138,000 individual strands of microscopic fibers. A similarly sized load of polyester produced 496,000 fibers. But it was acrylic that yielded the greatest number of fibers, spewing out a whopping 729,000 individual particles. The polyester-cotton blend shed the least amount of fibers on average, but the addition of bio-detergents or conditioners caused more plastic particles to be released. Given that virtually all of us do the laundry on a consistent basis, that adds up to an astronomically high number of microplastic particles. It’s not immediately clear how much of these fibers eventually make their way into our aquatic environments, so more research is clearly needed to find out. Some jurisdictions have already banned the use of microbeads from personal care products, but banning the use of synthetic textiles is an entirely different—and wholly unrealistic—proposition. It’s a problem in need of a different solution. “The societal benefits of textiles are without question and so any voluntary or policy intervention should be directed toward reducing emissions either via changes in textile design or filtration of [wastewater], or both,” suggested Thompson in a statement. Moving forward, the researchers are hoping to understand why certain types of fabrics are releasing substantially more fibers than others—a finding that could have an impact on how our clothes are designed and manufactured. It could also influence the choices we make as consumers. More work is also needed to understand some of the other factors that are affecting the leakage of microplastics from our clothing, such as wash duration, washing machine filter designs, and spin speeds.